Building a tiny house on wheels is a lot of work, especially if you’re doing it yourself and have never built one before (and if it’s a 40+ foot long tiny house on wheels like mine lol). But the question is, is it worth it? From a financial standpoint, building your own tiny house on wheels could save you tens of thousands of dollars. That could mean that you could afford to build a bigger tiny house than you’d otherwise be able to afford (twice as large) and/or include that many more modern conveniences, technology, etc to allow you to make even more of your tiny house living experience. Typically, your cost for labor will be about the same amount or so as your materials. So if you’d pay $70,000 to a builder to build your tiny house, it would cost you about half, or around $35,000 typically, to build it yourself (with some help from friends and family, which might cost you some pizza and/or beer ;). Now building it yourself will most likely take a lot longer to build it, but even if it takes you a year, that’s $35,000 you are essentially paying yourself in that year (or the equivalent of $70k a year if you can get it built within 6 months!). That’s like having a pretty good paying 2nd job. You’ll also need to set aside some additional time up front and along the way to research and learn how to build a tiny house, see how others have built theirs, read some books, watch some videos and hopefully go to a Tiny House on Wheels building workshop to get all your remaining questions answered and give you that last bit of assuredness (is that a word?) that you’re ready to start building your tiny house! So for a part-time or spare time gig, financially for many, it could very well be worth doing. But why else would you want to consider building a tiny house on wheels yourself? These learned building skills will come in “handy” later in life and help you more easily make modifications or repairs to your tiny house in the future should you need or want to make any (which again could save you lots of money). And you’ll also learn new ideas and ways of doing things than you otherwise would have known from just looking on pinterest or facebook or wherever when you’re in the process and having to problem solve and find solutions to get a certain look or functionality (that in and of itself – practicing critical thinking and finding your own solutions – is a great skill set that will aid you in all areas of your life). When I set out to build my tiny house on wheels, I’ll be honest and tell you I didn’t have it all figured out. Not by a long shot. I did know how long I wanted it (that’s a difficult one to change once your trailer arrives lol), and how I wanted it to look (more or less), the layout of the rooms and the flow of the house, but there were a LOT of details I wasn’t sure about. I could have spent another year trying to figure it all out and have it all mapped out (and it would have still changed along the way), but I knew enough of what I wanted to get started. When you build the house yourself, you can make changes along the way. It’s really hard to figure out the inside space, of how much space you’ll need for this and how much room for that… You can draw it out on paper or use programs like google sketchup to render it in 3D, but really until you’ve created the space and can FEEL how much space you have (at least in my opinion), it’s hard to get it just right (granted, I’m also a perfectionist lol). Also, sometimes regardless of how much planning you do up front, there are new things that develop or ideas or different ways of doing things. You might be in the middle of building a part of your house and realize its just not going to work the way you thought it would, or there’s not enough space for that – or too much space – or you change your mind… There’s lots of variables along the way, and you can flex and adapt as you go based on how easy or difficult it may be to build, or based on feedback from other people or builders, or on new ideas or gadgets that come about (I see new clever products coming out all the time that make me rethink certain aspects of my tiny house to make it even cooler, convenient, cheaper, fun, etc). When you look back on the tiny house you built yourself – going back through your photos from when it was just a bare metal trailer and not knowing for sure if you could really build something so great – to the finished, functional home that is now yours and ready to live in, it’s a feeling of accomplishment and satisfaction you can’t buy or get any other way. Knowing what you went through, the problems you encountered that you figured out a way to solve, the time you didn’t think you had, the jokes from people who thought you were crazy wanting to go tiny who are now some of your biggest fans… it definitely makes something more of you and for sure adds to your character (and not to mention your resume). And if you can build your own house from scratch – and a tiny house at that with all its new complexities and complications – what else can you do?? There’s a ton more reasons why its worth building your own tiny house on wheels. If you’ve got some to share, please share below in the comments! Go Tiny & Be Free! PPS> Have you “liked” us on facebook? 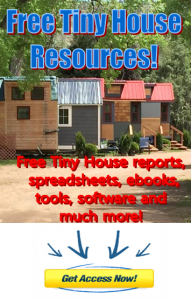 Join us as we feature Tiny Houses on Wheels and Freedom, including Tiny House on Wheels Community updates, workshops and so much more! Just go here now and like the page!